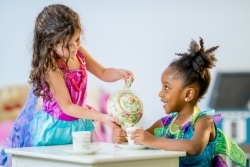 Melbourne, FL, March 12, 2019 --(PR.com)-- ABA Technologies, Inc. in partnership with Florida Institute of Technology, announces the launch of a new two-part continuing education course on teaching pretend and imaginative play skills. The courses prepare participants to assess and develop the imaginative play repertoires of young children. Presenters Nancy Champlin, MS, BCBA and Melissa Schissler, MS, BCBA of ACI Learning Centers introduce their research-based program and product line: Pretend Play and Language Assessment and Curriculum (PPLAC) and PlayTubsTM. Both courses offer Type 2 BACB credit. We are experts in Applied Behavior Analysis, curriculum development and instructional technology, organizational behavior management, and professional development and dissemination of behavior analysis applications. We are pioneers in developing and delivering online professional education and continuing education for practitioners of behavior analysis. Unlike other similar companies, we introduce a unique technology and experience that results in high engagement, value, and advancements for our customers’ careers. With decades of national and international experience, we offer value, passion, and partnership that is one of a kind. Click here to view the list of recent Press Releases from ABA Technologies, Inc.